Look out…I have been sewing again. I challenged myself in my blog post last week by saying that I need to sew this piece, with its supplementary weft pattern and weft twined bands…..
into something that would extend my meager sewing skills. So, I had to resist the temptation to simply fold it, flip the end over to make a flap and sew up the sides…done, easy, onto the next project. I decided that I wanted to make a kind of sausage bag, that is, one with a flat bottom and rounded sides – a sewing challenge indeed for this inexperienced sewer. I Googled away for instructions and found none. How to get the straight edge of the main piece to bend neatly about the rounded ends? ?….for me it was kind of like trying to get the square peg to fit the round hole. I will show the still unfinished bag to you a bit later and then you can judge for yourself whether I succeeded! And now I can even better appreciate why so many bags made by the weavers I have met here are simple rectangles, folded in half and sewn up the sides. Of course, it makes perfect sense after having worked weeks to weave a piece to want to use it ALL…not cut it up, tuck and pull it about to make an ”interesting” shape and besides, it will hold more that way too. 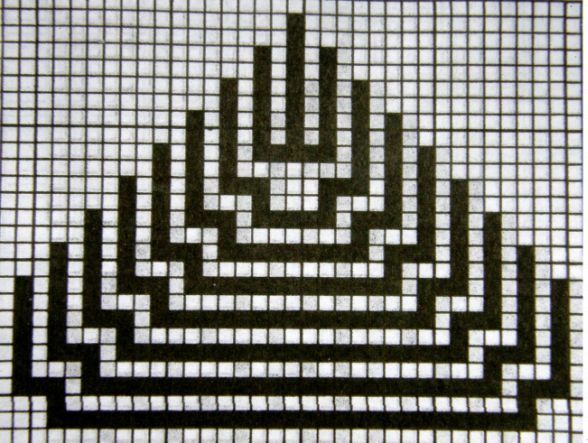 So, I have been looking through some of my photos of weavings and here and there online and have some bag pictures to show you. What a wonderful variety of designs, structures and materials I saw but all with the same highly practical shape…a basic square or rectangle. 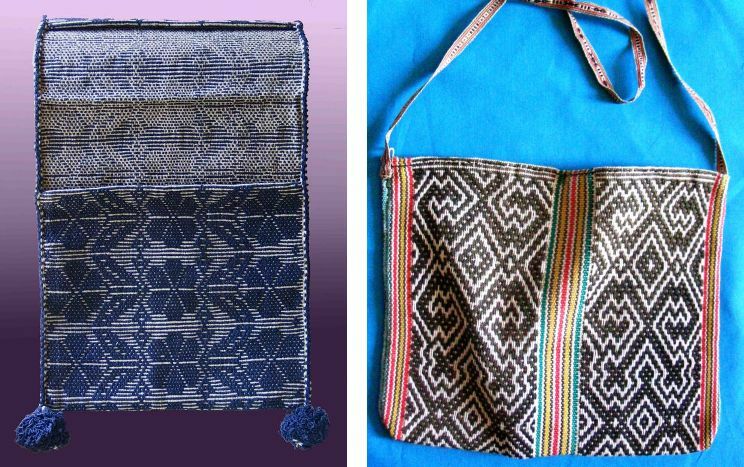 The bag on the left is knotted using a fiber extracted from a plant related to the pineapple which is called “garabata” here and is made by the Ayoreo people of eastern lowland Bolivia. 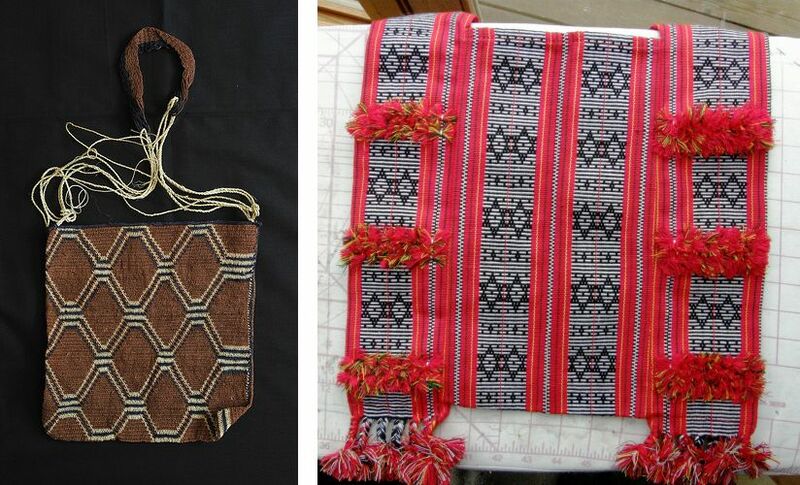 The one on the right, from Betty’s collection, was made by people of the hilltribes of northern Thailand and appears to be made up of several bands sewn together. 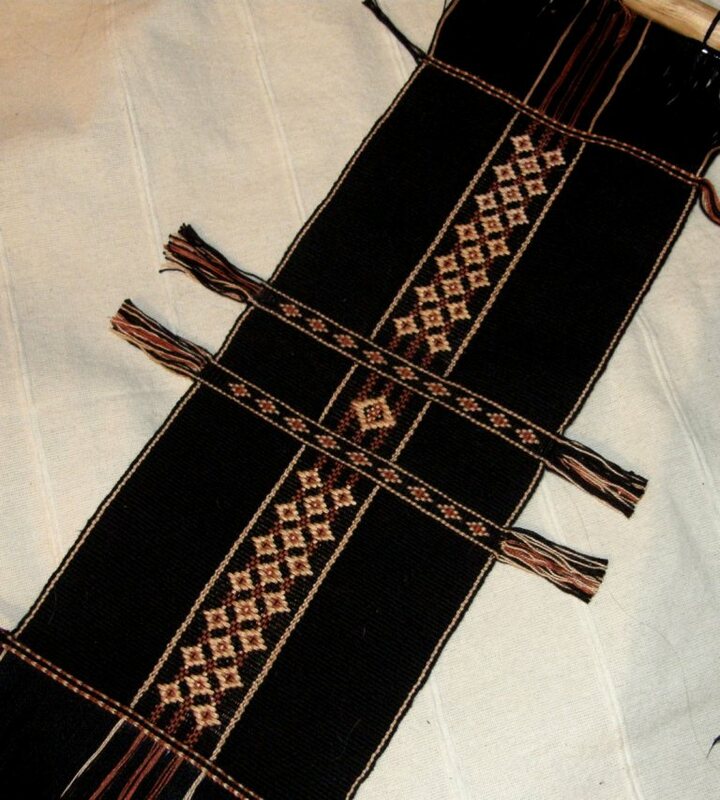 The Ayoreo work their pieces as rectangles which are folded and then sewn together at the sides. 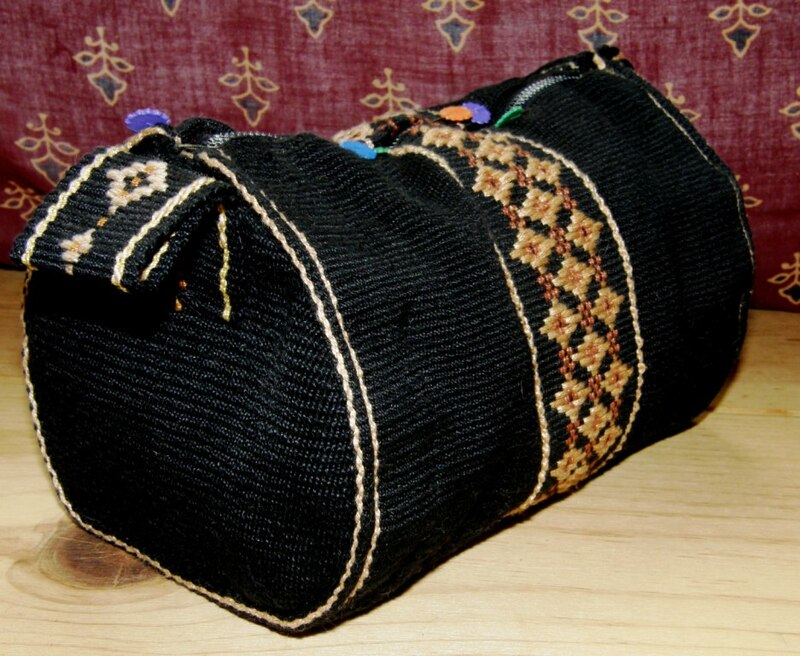 According to Peter Collingwood in The Maker’s Hand, bags or bilums, some made with the same knotting technique used by theAyoreo, are made in Papua New Guinea but worked as a tube rather than a flat piece….only one seam to sew. 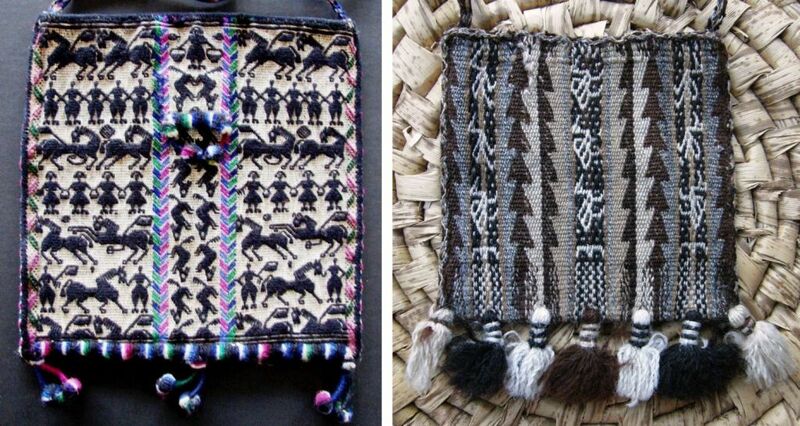 Above left is a dual-pocket cotton saddlebag or alforja from coastal Ecuador. Both ends of the woven fabric are folded in toward the center to form the two pockets. On the right is a cotton bag from tropical lowland Peru. You might recognize the design from my recent placemat project. Two coca leaf bags or ch’uspas from highland Bolivia and Peru made with cotton, acrylic and wool. 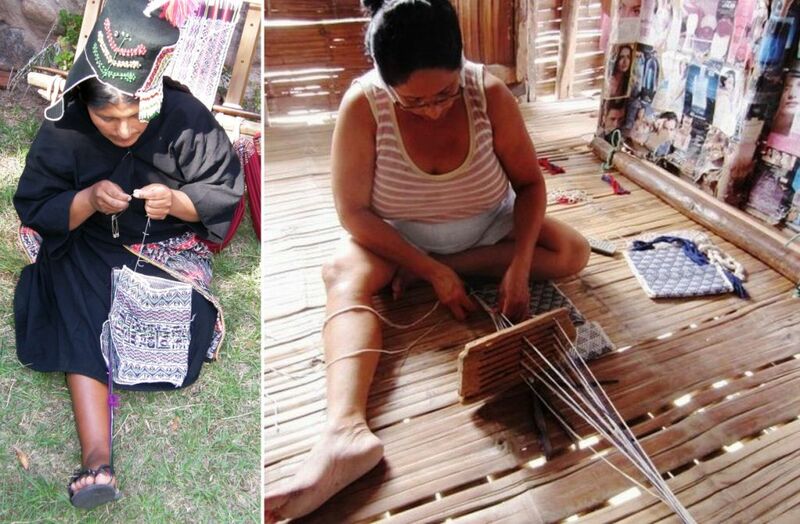 The Montagnard (Vietnamese hilltribe) weavers make what they call “Bible bags” with commercial cotton thread. Verses from the Bible are often woven into the straps. Cotton satchels with zippered compartments and buckles are being made by one family in coastal Ecuador for the tourist market using ancient weaving techniques and often their own homegrown and spun cotton. I would say that the bag made in Tinkipaya, Bolivia on the left is destined for the tourist market too. The double weave bag on the right is from Mexico and has motifs that are commonly woven by the Otomi and Huichol people. I think that the weavers make up for what may be seen as a lack of “shapeliness” in their bags by using various finishing techniques. I am a big fan of finishing techniques and I too enjoy “dressing up” a piece with pretty straps, pom poms, baubles, braids, tubular bands, cross knit looping, fringes, tassels and other frills, fluff and stuff. 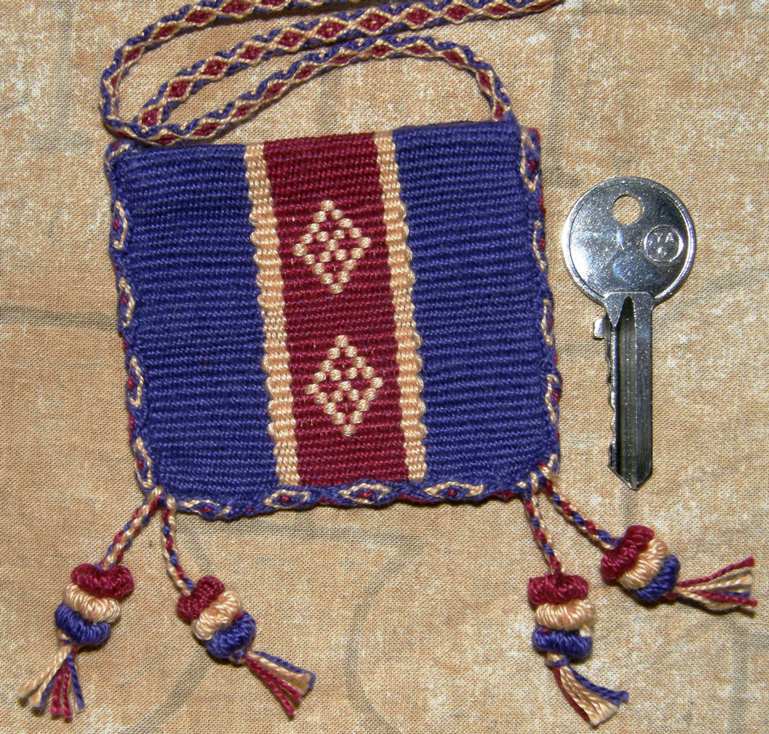 The tiny amulet bag at left has a crossed-warp strap, tubular band edging, braided tassels and Bolivian-style pom poms. The body of ceremonial ch’uspas are quite often completely dwarfed by a myriad of tassels, giant pom poms, braids and coins making them both colorful and musical as they jiggle about on a dancer’s hip. I love the braided treatment of the warp ends on the Mexican bag. Colorful edgings are added to pieces sometimes to strengthen and reinforce the edges or prevent the tendency for fabric which has been woven with overtwisted yarn to curl . And sometimes it is there solely for decoration. The cotton bags above left from coastal Ecuador, which have been made for the tourist market, have been edged with plain-weave bands and have had large tassels added at the corners. The technique is the same as that used on the traditional saddlebags where the bands are used to strengthen the edges. I have been told that tubular woven bands are added to large pieces in Chinchero to help stop curling. I would say that one has been added to the small zippered purse above for decoration. 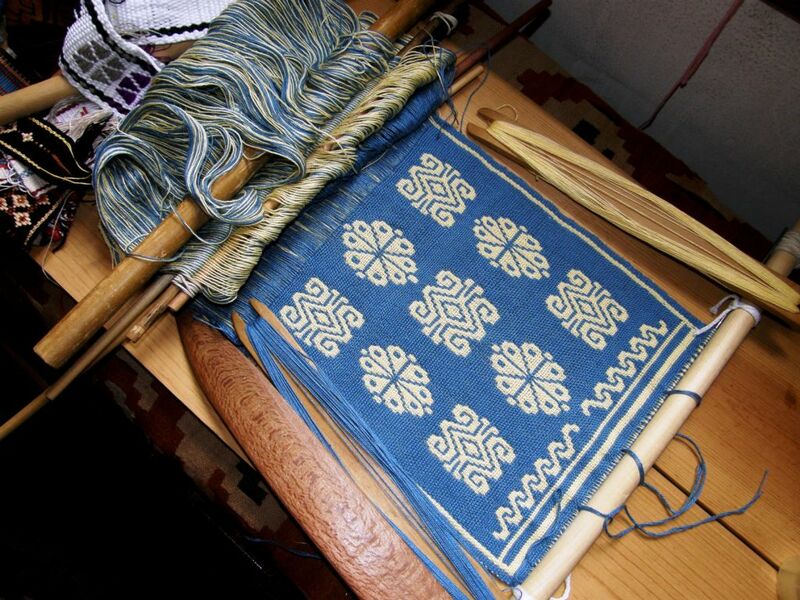 Here you can see highland and lowland weavers adding bands to the edges of their woven pieces using different techniques. The edging bands used by both weavers are sewn and woven at the same time using the weft as the sewing thread. (see the videoshere ). The weaver from the Tarabuco area of Bolivia uses a toe and finger-tensioned warp with a heddle and loop shedding system. Trinidad from Manabí province in Ecuador uses a homemade rigid heddle to create her sheds. One end of the warp is generally attached to a screwdriver which is wedged between the floor boards and the other end to a wall beam or other fixed point. I have yet to get a zip I like for my bag creation this week. I have just pinned a metal zip into place for the time being. This looks like a giant sports duffel bag, doesn’t it, but it actually only measures 7″ x 4 1/2″. It’s a nice size for a travel cosmetics bag. The sides are made from left over material from one of my purse projects and were woven using the three-shed method that I describe in my Andean Pebble Weave book. This produces a nice dense piece of cloth which worked well for this purpose. I cut them after a generous application of a “stop fray” product and then came the fiddly sewing process. I made use of my sample band to add a tab…something to hang onto while pulling the zip open. I added black-and-beige tubular bands to both sides to outline the rounded inserts but, darn, you can’t even tell they’re there!! And sadly, the weft twining ended up on the bottom. That will teach me for weaving away with no end product in mind! But, sewing skills were extended and that was the post- weaving plan. You may remember me saying that this finnweave technique behaved very well for me in that I did not need to use a reed to maintain the warp spacing. Well, it turns out that I may need to rethink that. You can see that the warps are spaced wider in the center than on the sides and I am having to fight a little with the right hand edge where the warps are threatening to scoot over next to each other. 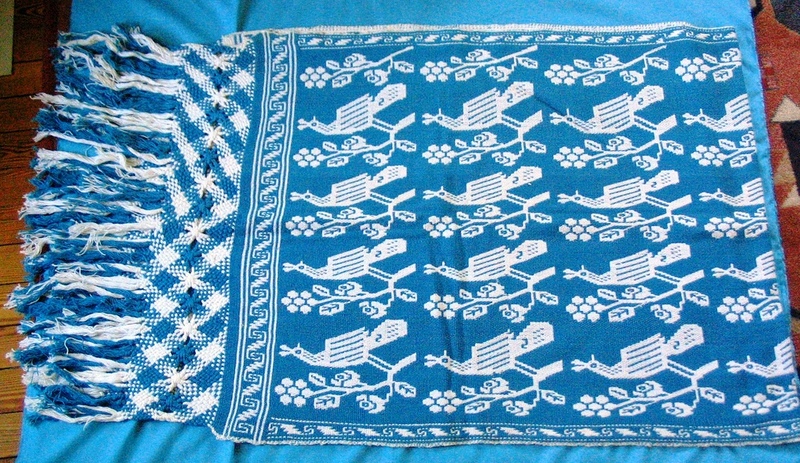 An Otomi shawl, or rebozo made in what I am guessing is the same technique. Look at the braided fringe treatment. Now my question is “what’s on the other side?” (see last week’s post). The other side of my piece shows the same motifs with their colors reversed but they are clearly imperfect. That is the nature of this technique. I have seen Huichol belts online that have the same “flawed” motifs on the back while on others the motifs are clearly perfectly reversible. I shall ask Karen if I may have a peek at the other side. Doramay Keasbey described in a recent article in Handwoven magazine (Jan/Feb 2011) five different types of double weave pick-up showing both sides of the fabric to compare the motifs. 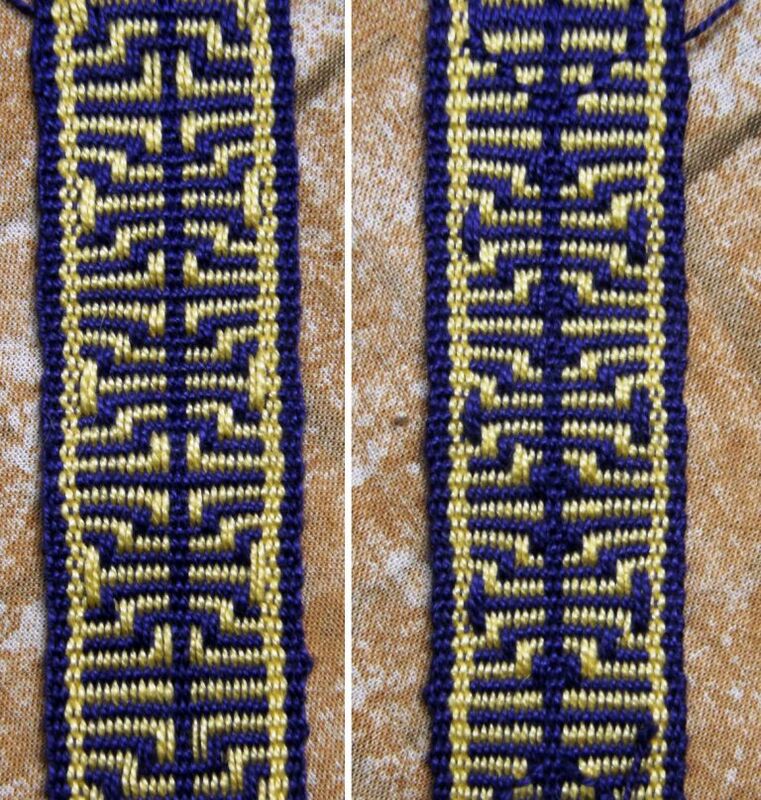 Some have varying degrees of feathering around their edges but are reversible while the motifs in the finnweave example have smooth edges but are not reversible. 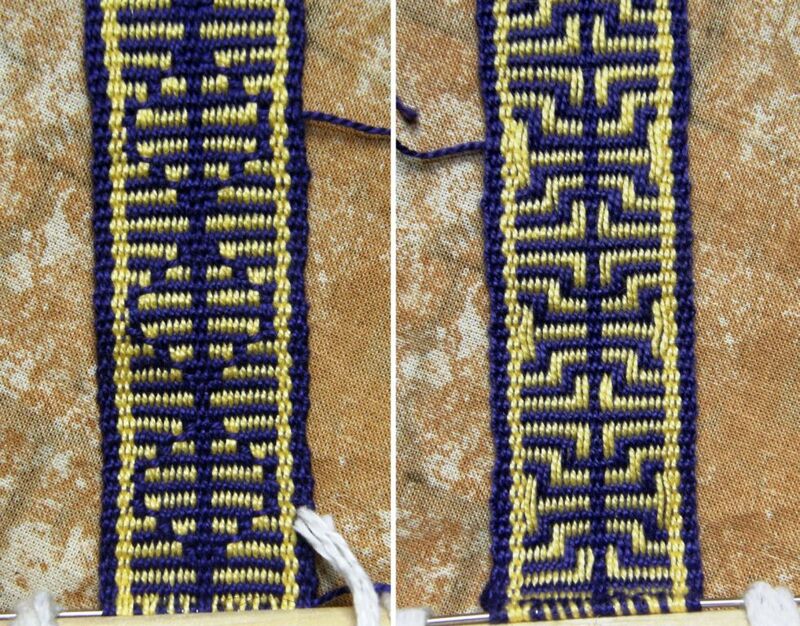 I wrote about this article in a previous post but I thank Marsha Knox, who has been making her own experiments in double weave pick-up, for reminding me about it. Ah well, I shall just continue with my ten-inch wide piece and dream about one day being able to make a rebozo! Something else I played with a little this week was two-color alternating warp floats. This comes via the “Worldwide Weaving Web”. Yonat cast the first strand in the web by weaving some bands in this technique and posting them on Facebook. Annie (ASpinnerWeaver) picked it up and went from there creating her own piece, a guitar strap, and posting it on Facebook too. That’s her piece pictured at left. I saw it and immediately loved it. It reminded me so much of something but I couldn’t quite pin it down. Someone on Facebook commented that it looked Egyptian while Annie herself remarked that it reminded her of some Hmong designs she had seen. Yet another said it looked like a person standing with open arms and legs. In any case I wanted to weave it. And then I remembered a motif from Bhutan that I have in a book which has some of the basic elements. This is what Annie’s piece reminded me of. I wove something based on Annie’s design making some changes to make it my own version. I used a solid color stripe down the center and added in a five-span float on the outside. What I didn’t realize was that by adding that single-color center stripe I had changed it into one of those “eye-bending” designs which changes when you shift your focus somewhat like those 3-D designs years ago that we all used to go cross-eyed over. It was only when I turned the band over to see “what’s on the other side” that I saw the other design. I wonder if you see it too. Look at the image, below left, of the back of the band with its diamonds for a while and then look at the one on the right of the front. What do you see now? Do you still see the stick-like patterns or do you see diamonds? After that, all I could see was diamonds!! I had to go take a break and come back to be able to see the nice stick pattern once again. Then I continued weaving it as a complementary warp technique which made the design reversible. It also compressed the motif so that the five-span floats were less cumbersome. Looking at it now all I can see is diamonds once again. The design is just made up of floats of alternating colors starting in the center and working their way out to the edges. 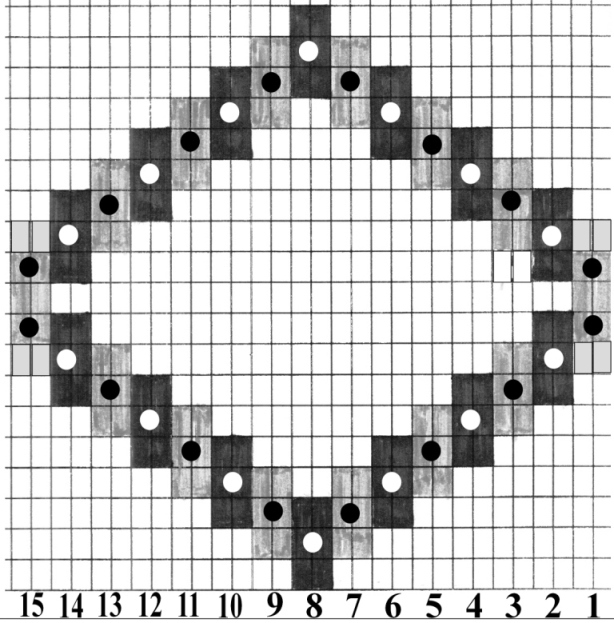 Here is a chart for a very large version of this pattern. So that was all a bit of a fun distraction! I have a band that I bought in Guatemala where the weaver has made use of some of these eye-bending motifs. It is in basic black and white which is very unusual in Guatemala where bright colors abound. I bought this belt in the same town that is famous for hair sashes which scream with color and are heavily laden with supplementary weft designs. When the black and white floats alternate in succession they produce quite a three-dimensional effect. 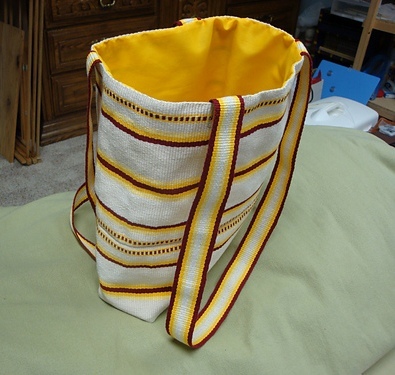 I have lots to report on the Ravelry group backstrap Weave-Along but I will save it for next week except for Amber’s amazing finished work which is in keeping with the bag theme in this week’s post. Look at her gorgeous lined tote bag! Okay, lining has to go on my list of sewing skills now…. Oh, and one more thing – another delicious distraction arrived, this time in the post…a birthday gift from my friend Anna in Australia. My goodness it was hard not to drop everything and get into this but I shall do so on the weekend. All my off-loom time this week has been spent sewing, trying to get that square peg into the round hole! 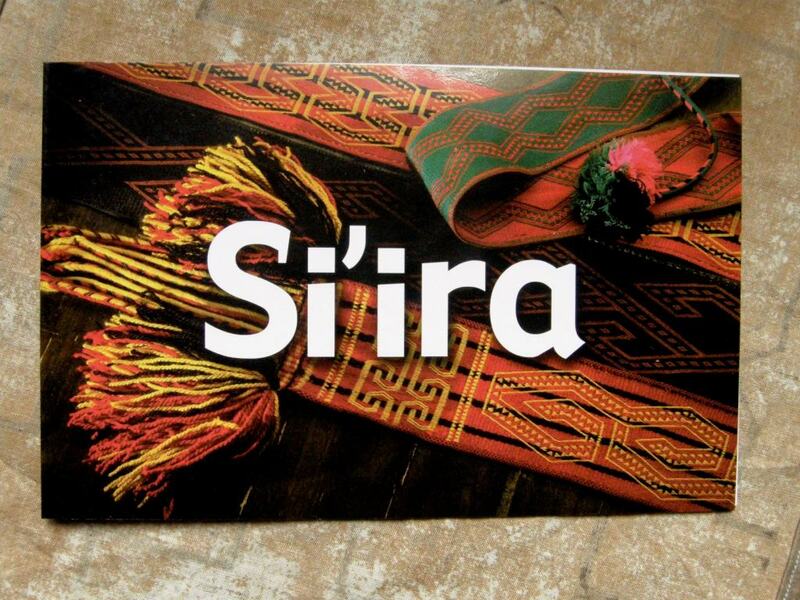 This book, by Dutch author Mirja Wark, is about the si’ira, which is the intricate belt weaving of the Wayuu Indians from the Guajira, the northern border area of Venezuela and Colombia. I flicked through and was immediately struck by a couple of things. It appears that the Wayuu make and operate their heddles in the same way as the Guaraní weavers here do, a way that is completely different to anything I have seen in the highlands or elsewhere. (see the pictures and video in this post) One of the Wayuu designs strongly resembles the design in the Ayoreo bag in this post. I imagine the Wayuu inhabit lowland regions like the Ayoreo and Guaraní….I need to stop here and go read! « Backstrap Weaving – What’s on the Other Side? So many wonderful ideas! 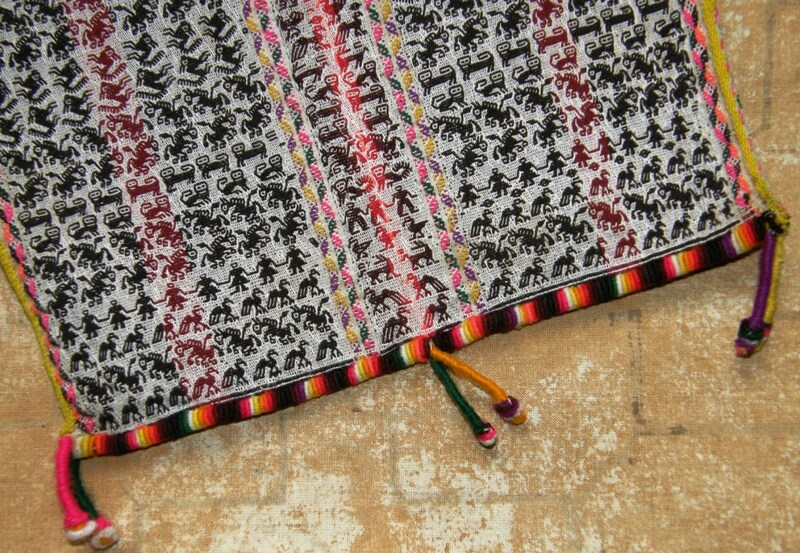 I found it very interesting that in the picture of the lady sitting on the floor using a wooden rigid heddle was using it in a horizontal position instead of the vertical position that I usually see..
great post, I’m all dizzy after looking at the diamond motifs… Your Huichol piece is gorgeous and bag design great. Indeed a pity of the twining on the bottom, you’ll just have to carry it sideways. Enjoy the book! I fought with 4 selvedges on a small band this morning and have a new appreciation for weavers being able to finish the final bit. cheers from ozzie. Go Argentina! Your duffel is one of my favorites here! I was going to say, but aren’t your nice twined bands hidden on the bottom now?? Anyway, you did a brilliant job sewing, and I don’t know where you get the idea that you’re not good at that part – perhaps just in comparison to your weaving skills, which are hard to match!